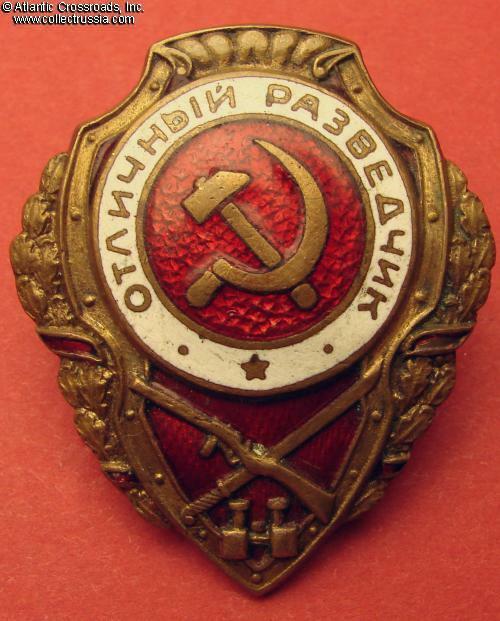 Excellent Reconnaissance Scout Badge, circa 1946-48. 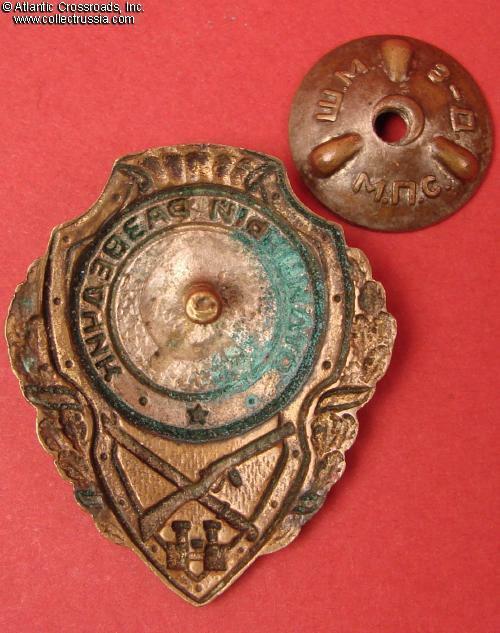 Brass, enamels; 45.3 x 38.3 mm. 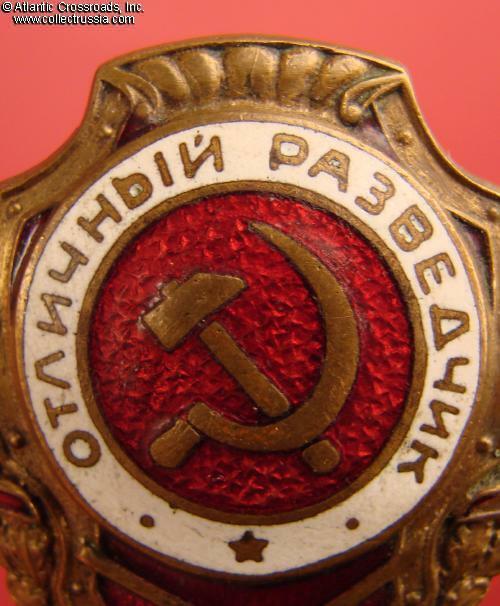 Featuring a classic shield shape tapering to the bottom, relatively big wreath and domed medallion, the badge is of the first NKPS type presented in the Airapetyan catalog as fig. 1 on page 107. Small details of the wreath however point out to the early post-war production by the same factory, by then known as MPS (note that it is distinctly different from the "square" and "luxuriant wreath" variations by the same factory, and is much closer to the first wartime version). 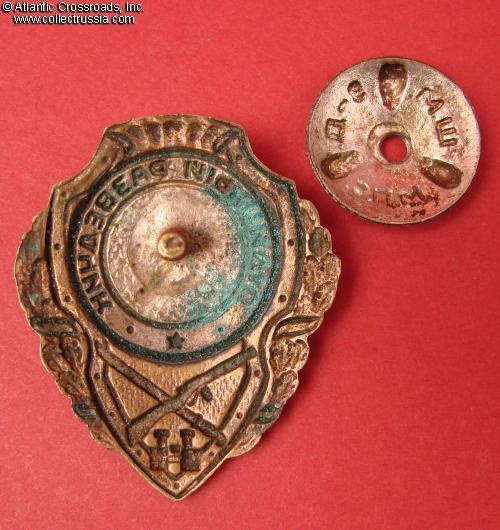 This variation of the Scout badge is believed to be very scarce. In very fine condition. 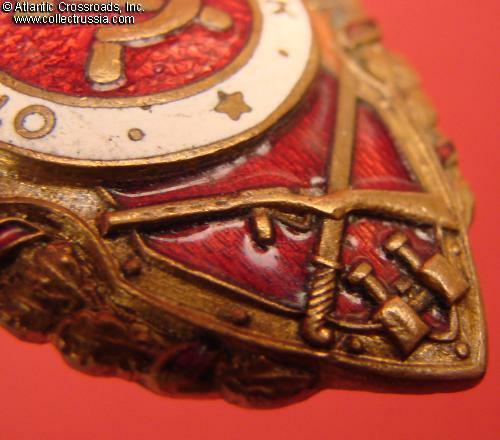 The red enamel in the center and lower part of the shield is extremely well preserved having only a few tiny scuffs and contact marks, none of the usual heavy wear; it still retains beautiful original luster. The more exposed white enamel in the band shows moderate buffing but no chips or other significant flaws. The red enamel is chipped on the upper right scroll in the wreath, and has surface flakes on the lower two scrolls, while the upper left scroll is completely intact. Because the area of the damage is so tiny, it doesn't significantly affect the overall impression from the badge. The details of the wreath, Dyagterev rifle and sword are very well preserved and crisp. 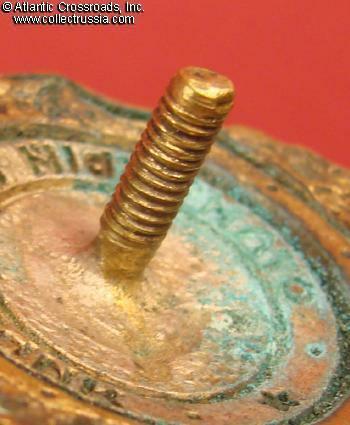 Some of the original silver finish is still present on the reverse around the screw post. The screw post is full length, approx. 12.5 mm, and includes original screw plate marked "MPS ShM". 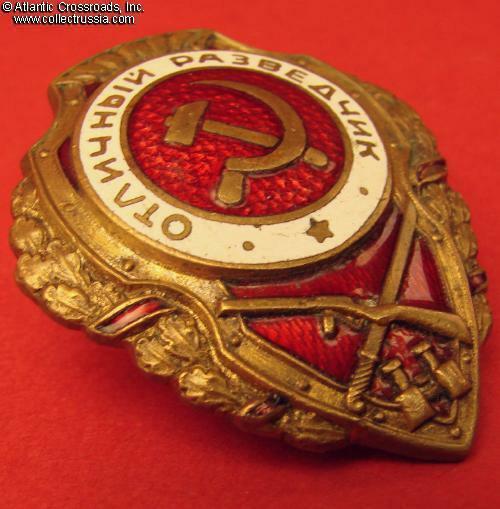 /See Airapetyan, "Breast Badges of the Red Army, 1941- 1945", p. 107, fig. 1/.